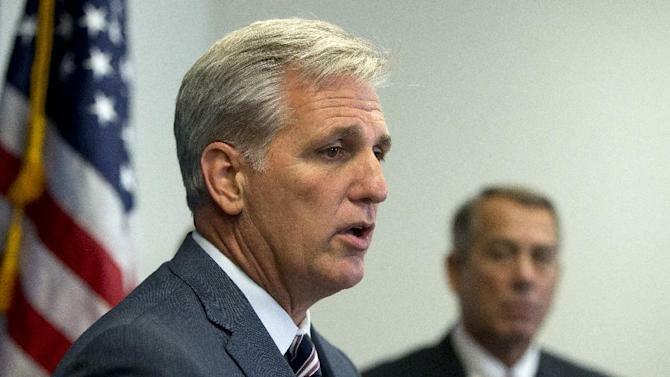 WASHINGTON (AP) — House Majority Leader Kevin McCarthy is promising conservative GOP lawmakers “I’m not John Boehner” as he seeks their support to replace Boehner as spaker. McCarthy and his two Republican rivals for the speaker’s job took turns meeting behind closed doors Tuesday night with a coalition of four groups comprising the most conservative members in the House. These are the lawmakers who forced Boehner to resign and now they’re maneuvering to deny his No. 2, McCarthy, the chance to ascend unless he agrees to various demands. Lawmakers present said McCarthy pledged changes to the House. McCarthy appears to have the support of most House Republicans and is likely to emerge as their nominee for speaker in secret-ballot elections set for Thursday. But that does not guarantee he will prevail when the full House votes for a new speaker in open session on Oct. 29. That’s when conservatives will have their leverage, because McCarthy can lose only 29 votes and still come out the winner. McCarthy, who represents a California district, remains the favorite and has Boehner’s support. But conservatives say they will not back him unless they’re convinced he’ll take the House in a new direction. They want more involvement in decision-making and a tough line on issues like increasing the federal debt ceiling and deleting funding for Planned Parenthood in must-pass spending legislation — even though that risks a government shutdown. “What Kevin has against him is he’s John Boehner’s right-hand man,” said Rep. Tim Huelskamp, R-Kan., chairman of the Tea Party Caucus. “He’s going to have to reach out and work with conservatives like they’ve never done since I’ve been here,” said Huelskamp, elected in 2010. A number of Republicans are insisting that whoever emerges as the nominee Thursday should get the support of all GOP lawmakers in the floor vote at month’s end, but there appears to be no mechanism for enforcing that. The uncertain outcome has caused great turmoil in the House, even as lawmakers face daunting tasks including raising the debt ceiling by early November to avoid a market-rupturing default. McCarthy’s candidacy was hurt by a gaffe last week where he boasted that the House’s Benghazi investigations committee could take credit for Hillary Rodham Clinton’s falling poll numbers. He retracted it, but Clinton is now using the moment in a campaign ad, and the fracas gave Chaffetz an opening to jump into the race. Chaffetz chairs the high-profile House Oversight and Government Reform Committee while Webster, who unsuccessfully challenged Boehner in the past, already has a handful of endorsements from conservatives. Massie said that all three candidates pledged they would protect the conservative lawmakers they addressed Tuesday from attacks by the U.S. Chamber of Commerce should it come after them in next year’s elections. The Chamber of Commerce and other establishment-aligned groups have sometimes meddled in GOP primaries to elect business-friendly Republicans over tea party adherents.